This page introduces the archaeological project run out of the University of Glasgow in collaboration with Historic Environment Scotland and the National Trust for Scotland tasked with writing up unpublished excavations on Iona from 1956-63, and reinterpreting the site in light of these results. The modern era of archaeological excavations on Iona begins with the late Prof Charles Thomas (Driscoll 2017). Thomas supervised excavations on Iona in 1956 to 1963. For various reasons, Thomas never managed to publish the full results of this work before his death in 2016. Researchers in Archaeology at the University of Glasgow are now bringing this work to light. This page presents an overview of the project to date. Charles Thomas reviewing the new HS site reconstruction of Iona at his home in Truro in 2012. Photo by Peter Yeoman. After the successful Iona Research Conference in April 2012, Katherine Forsyth of the University of Glasgow reached out to Prof Thomas in 2012 to inquire about his unpublished excavations on Iona. Later that year, Thomas generously granted his archive to the former Historic Scotland. After the archive was conserved, catalogued and repacked, Ewan Campbell of the University of Glasgow successfully won a grant from Historic Environment Scotland to publish these excavations to a modern standard, with Adrián Maldonado as research associate. 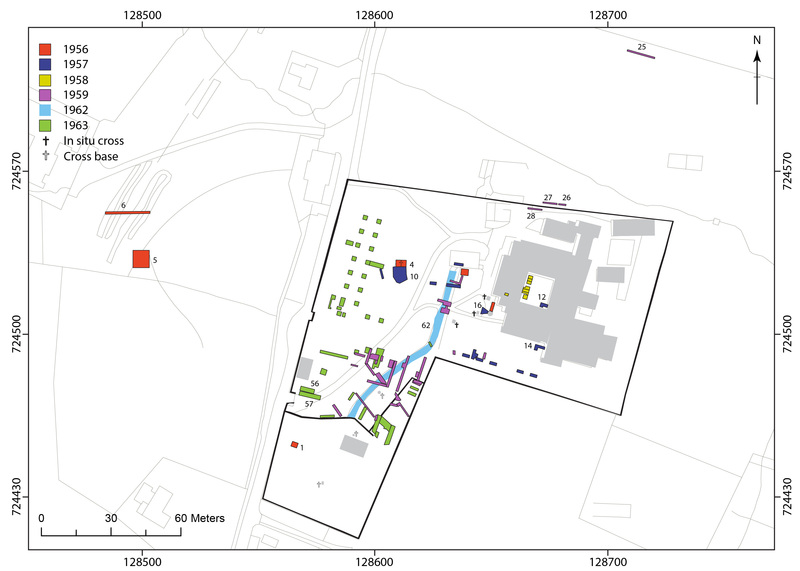 Plan of all trenches excavated on Iona 1956-1963; abbey and other structures shown in grey. Background mapping © Crown Copyright and Database Right 2017. Ordnance Survey (Digimap Licence). Charles Thomas’ excavations were funded by the Russell Trust and began in 1956 with a preliminary season of trial trenching and the first archaeological survey of the island of Iona as a whole. Their surveys of the island provided the basis for the later RCAHMS Inventory (RCAHMS 1982), including the first attempt at a catalogue of all early medieval carved stones. Trenching increased in 1957 with interventions to south and west of the abbey. Thomas could not attend in 1958 as he had recently been appointed Lecturer in Archaeology at the University of Edinburgh in 1958, but his core team led by Peter Fowler and Elizabeth Burley (later Fowler) carried out excavations on his behalf in the cloister and the hillfort of Dùn Cùl Bhuirg. 1959 season saw intensive trenching in the area between the Reilig Odhráin and the Torr an Aba, which at this point was still privately owned sheep pasture. Thomas then took a hiatus for a few years as he began fieldwork on other early Christian sites in Scotland; however in 1962 he employed one of the student volunteers from the 1959 excavation, Richard Reece, to oversee landscaping and clearance being undertaken by the Iona Community in advance of the 1400th anniversary celebrations in 1963. It was during these works that the famous Sraid Nam Marbh or ‘Street of the Dead‘ was fully exposed, having been first encountered during the 1957 excavations. Thomas returned for one final season in 1963, which saw the most intensive trenching in the area west and southwest of the abbey. Copper-alloy mount, possibly from a reliquary shrine, found during excavations on Iona led by Prof Charles Thomas in 1959. 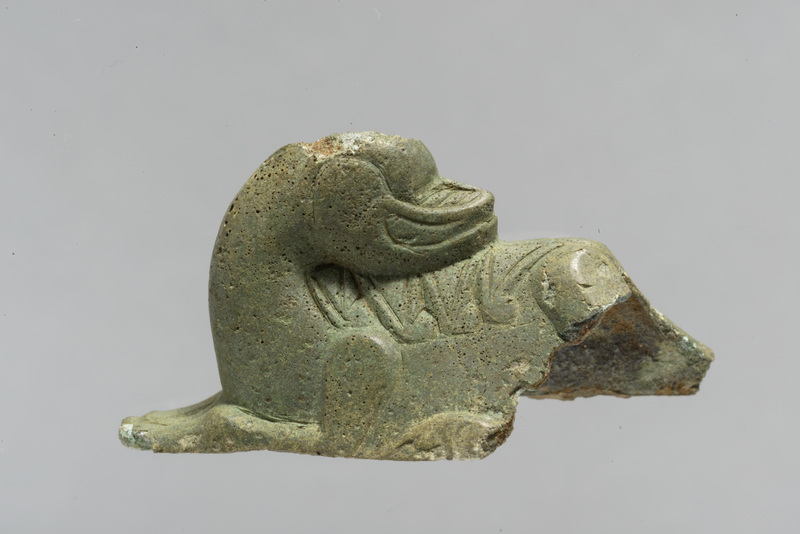 Among the unpublished finds from the excavations were two pieces of fine metalworking which appear to have been broken off of shrines or other ecclesiastical items. One is a lion-shaped mount (see featured image above) dating to the 8/9th century, and the other is a small bronze head, seemingly from a reliquary shrine of the 11/12th century. Papers on these are being presented at the 8th International Insular Arts conference in Glasgow 11-14 July. Aside from the excavations, other notable finds from the surveys and catalogue of carved stones include two inscribed stones, the 7th-century Latin inscribed ‘Lapis Echodi’ and an 11/12th century runic-inscribed cross slab dedicated to a Fugl son of Olvir. The results of our radiocarbon dating programme will be made available soon. While there have been several campaigns of excavations on Iona since Thomas (O’Sullivan 1998), these authors have only had partial access to the Thomas archive of materials. With the benefit of years of later work, we are now able to reassess Thomas’ findings in a way that could not be done until now. We are applying the latest scientific techniques of analysis to the artefacts, and have obtained radiocarbon dates from the preserved organic materials. In 2017, we went back to Iona and re-excavated two of his trenches to get still more information on what he found; the preliminary results of that work are now available here. But from the work we’ve done already, it is clear that Thomas’ work has the potential to change what we think we know about Iona. In one way, the publication of the results of his work is only the beginning of this work, and we are honoured to have played a role in taking his legacy forward. We are hoping to bring the results of the Charles Thomas excavations to publication imminently. In the meantime, you can now download our full data structure report of the excavation archive at the link below. Download the Charles Thomas Excavations Data Structure Report (PDF). See also to 2017 excavations page for more on Charles Thomas’ trenches. Iona Research Group 2017, Charles Thomas Excavations on Iona 1956-1963. Retrieved from http://ionaresearchgroup.arts.gla.ac.uk/index.php/projects/charles-thomas-excavations-1956-1963/, accessed ___.